It is getting hot here in South Florida and that means mango season! While I am not one of the lucky ones with a mango tree in my backyard, I do tend to somehow acquire a surplus of mangoes. 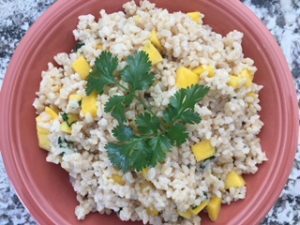 Fresh mangoes are so delicious on their own, but sometimes it is fun to experiment and add them to different recipes, especially when you happen to have a large supply. My husband makes a great mango-avocado salsa that we like to put on top of mahi, and I have experimented with adding mangoes to baked goods (another mango recipe soon to come). 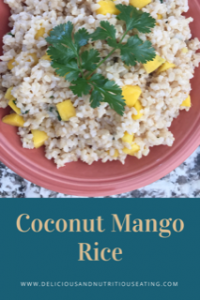 Last year I had fun making some refreshing Coconut Mango Popsicles…I am however, super excited about this coconut mango rice recipe I am going to share with you. Before I get to that though, I just want to take a minute to talk about the glorious mango. If you weren’t already aware, there are so many different varieties of mangoes. If you don’t like one kind, that does not mean you don’t like mangoes! When I first moved to Florida, I thought I didn’t like mangoes until I started trying all the different kinds. We even went to a mango festival and got to sample a whole bunch! I discovered that I like the ones that are firm and sweet, but not too sweet. There are some that I find too mushy, and some that I feel taste a little bit like pine trees. That’s a thing….right? Of course I can never remember the names of the different varieties though, I just have to try them and see! So other than mangoes being super delicious…. why should you eat them? Mangoes have a ton of nutrients! One of which is beta-carotene, a precursor to Vitamin A, which may help protect against certain cancers and can lower your risk of developing asthma. Fiber and potassium are also present in mangoes, and are both great for heart health. Mangoes also have Vitamin C, Folate, Vitamin B-6, and antioxidants, among a host of other nutrients. Now onto the recipe! It is seriously so easy. If you can cook a basic batch of rice, you can make this. 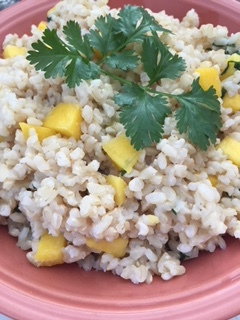 Basically, I just cooked short grain brown rice in a coconut milk beverage to infuse some flavor, added some mango, fresh cilantro from my herb garden, and a little bit of salt. Super easy, flavorful, colorful, nutrient-full, and delicious! 1, Bring coconut milk beverage to a boil in a medium pot. 2. Add rice, turn down to a simmer, stir and cover with a tight fitting lid. 3. Simmer on low for 45 min. 4. Remove from heat and fluff rice with a fork. 5. Stir in mango, cilantro, and salt if desired. 6. Cover with lid and allow to steam in pot for another ten minutes to allow mango to warm.